The first real industrial group, the founders of Industrial Records and one of the most important electronic music innovators of all time. Growing out of the extreme performance art group COUM Transmissions, TG redefined music and laid a large part of the groundwork for all electronic music that followed. From their first performances in 1976 to their last gig in San Francisco in 1981 (recorded and released as "Mission Of Dead Souls"), they challenged and threatend so-called "normal", society - denounced from the floor of the House of Commons as "Wreckers of Civilisation" as the Coum Transmissions "Prostitution" art show in London's ICA (at which TG played their third show) came close to causing riots and set the stage for the punk revolution. Musically, they were extreme and uncompromising, using technology to make anti-music, which redefined music for all time. Their experimentation led them to pioneer sampling and looping techniques adopted by many of those who came after. 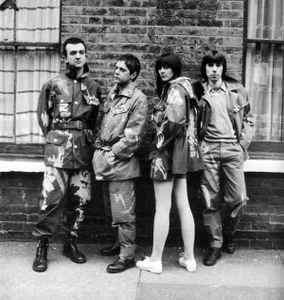 Throbbing Gristle officially began at September 3, 1975 and they officially split on June 23, 1981. After they split, Genesis and Peter formed Psychic TV (and Peter later joining Coil) and Chris and Cosey becoming, well, Chris & Cosey. However, they came back together 23 years later in 2004 to plan an ill-fated weekend festival, which became a one-off recording session in London when the festival fell through, releasing a limited TGNOW album of the recordings. A series of new releases and remasters followed as well as live performances. In 2010, Genesis withdrew from touring with TG and the three other members renamed themselves X-TG. However, Peter's death in November that year brought an end to TG/XTG for good. One final release, released under the name X-TG, followed in 2012. A note on bootlegs: Throbbing Gristle was an organisation and all releases had to be approved by the organisation, not individual members. Most official releases were released by Industrial Records, Fetish Records and Mute (some exceptions exist). Any word on the next lot of reissues? It's well past the late Jan release date. ...yeah, it's surprising the Celluloid bootlegs of 2nd Annual Report & DoA are not banned from sale - they were responsible for Gen going off his nut in a Virgin Megastore & destroying the lot, back in the 70s! These were blatant rip-offs of official LPs made purely for profit by a major company whereas The Kill was (I believe) done by a fan, in a very limited edition, as a tribute. I see some unofficial TG releases are banned here while others can be traded. I wonder how discogs determined this. I can understand banning newer bootlegs from the past few years but bootlegs that are decades old are musical artifacts especially for a band like TG. Something like The Kill live at Scala is a 30 year old bootleg that they made like 300 copies of. I really doubt that TG members object. Just to chime in from a new fans perspective: I've only recently discovered their music as I have been listening to this band for the past couple of years and really enjoy their output. I am also a very dedicated record collector and the chance to purchase new pristine copies of their records is something very important to me. So the fact that they reissue these albums is a grand opportunity for someone like me. I really think these reissues and reissues in general are more of an attempt by bands to reach new audiences and I think they recognize that the collectors are a big part of that audience. Discovered TG aged 15 in early 80's after seeing the cover of 5 Knuckle Shuffle in Virgin. Asked the man to put it on in a booth & was firstly stunned, then hooked. Love the earlier stuff more - especially the ICA gig, but favourite tracks to listen to are Discipline (live Berlin) & See You Are (live Manchester). Managed to get all IRC tapes at one stage but sold them so I could buy TG24 & TG+.....biggest mistake of my life. I found the CDs too clean and missed the atmosphere I got from listening to the tapes on a basic player. I managed to get a few back since but not so easy (or cheap) nowadays. Love the band & love the individuals. I wish i had something negative to say about TG. but I don't i love this band..i have a TG tattoo and everything. if you think you should get into TG the answer is yes. Throbbing Gristle's Genesis P-Orridge, Cosey Fanni Tutti and Chris Carter are featured in the music documentary Industrial Soundtrack For The Urban Decay. DVD & Bluray release features +30 minutes of unseen interviews. Note for nerds. The 2011 reissues use the original mixes as heard on the Industrial releases. The Mute CD's released in 1990 contain remixes, which mainly consists of extra reverb on studio tracks.